Today we would like to offer graduating seniors an exclusive opportunity to join the Crimson & Gold Society at a reduced rate. This offer is only available to graduating seniors and is for a limited time. The Crimson & Gold Society is an elite group of KA supporters who believe strongly in the Order’s role to develop capable leaders. Will you consider becoming a member of the Crimson & Gold Society today? Membership in the Crimson and Gold Society is a special way to leverage the power of relationships with brothers working in every industry imaginable. When you join the Crimson and Gold Society before June 30, 2019, for as little as $42 per month, you not only receive two years of membership for the price of one, you are also invited to the annual Crimson and Gold Society Dinner during our National Convention in New Orleans on Thursday, August 1st. 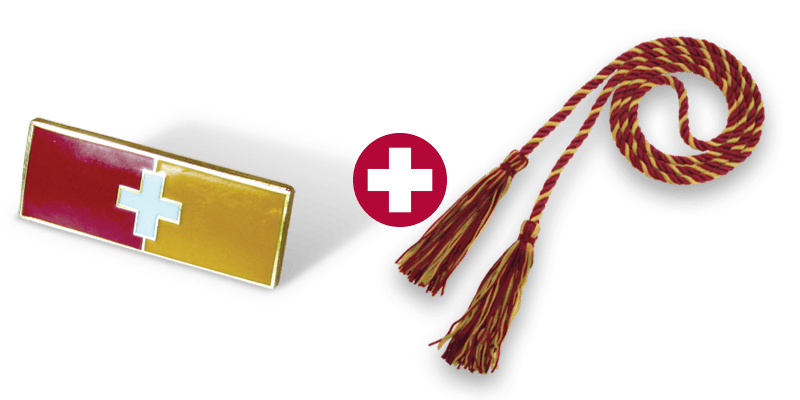 As a special bonus, we would like to send you a Crimson and Gold Society Honor Cord and Lapel Pin to wear at graduation to represent your membership in this prestigious society. Exclusive KA Crimson & Gold graduation honor cord and label pin. Two years of membership for the price of one. Networking opportunities with successful KA’s from around the country. Exclusive invitation to the annual Crimson & Gold Society Dinner. Receive a two year membership along with a Crimson & Gold Honor Cord and Lapel Pin to wear at graduation. Yes, I will join the Crimson & Gold Society Today! This elite group is the backbone of Kappa Alpha Order Educational Foundation. Each member provides an unrestricted annual contribution of $1,000 or more to provide leadership education training programs, scholarships, and internships. Ultimately, the Crimson & Gold Society supports young men who will become strong leaders who succeed in the business world…and in life. Join the Crimson & Gold Society Today!